Rafael is definitely the best clay court specialist in the Open Era. 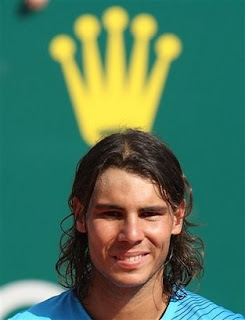 He has just made a historic win last night at Monte Carlo by winning 4 consecutive titles in a row. What more he won the doubles final on the same night together with Tommy Robredo! I was worrying in the second set when Federer lead by 4-0. Who knows Nadal will fight back and win the second set 7-5. That's exactly the same Rafael Nadal and his fighting spirit when I first saw him play at the Australian Open against Lleyton Hewitt in the quarterfinal. Now, Rafael Nadal, the undisputed claycourt king, will be out to maintain his dominance when he chases a record fourth consecutive title at the Barcelona Open, which starts today.